Canoe and Kayak rental for the Little Red River. Indian Hills offers the best in golf, equipment, and apparel. Fairfield Bay Marina. Boat Rental, Sugarloaf Tour, Lake Cruises, Fish Feeding Frenzy, Little Red Café, Gift Shop and Store, and Boat Storage. 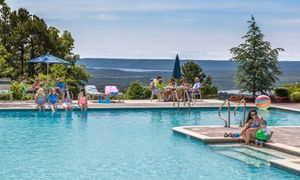 Ranked the #1 resort golf course in the state of Arkansas, Mountain Ranch is an 18 hole championship layout carved out of splendid natural Ozark beauty. Blanchard Springs Caverns can hardly be described in words! You must visit the caves truly understand and appreciate their beauty. There are four different tours offered at the caverns; the Dripstone Trail, the Discovery Trail, the Discovery in the Dark Headlamp Tour and the caverns newest trail, the Wild Cave Tour. Cool Pool Café- Great food and a great swimming pool and kiddie pool. Also a great view of the Greers Ferry Lake. Southern home cooking at its best! Our Favorite Restaurant that supports all in uniform. Our Favorite BBQ of all time. Located in Clinton.